Every Monday, Sylvie Sedagonji and Ulriche Hontonnou leave their houses in the city to plant organic vegetables as small farmers. In Benin, like elsewhere, an increasing number of customers are gravitating toward healthy products. Sylvie Sedagondji doesn’t get sick anymore. Certainly, she’s tired sometimes when she wakes in her mud hut, as are many who must rise at six in the morning. But the pain is gone. A colorful lizard, the size of one’s hand, crawls along the exterior wall, a rooster crows nearby. Palm leaves rustle, as does the distant ocean. It will be hot soon. Another day in the vegetable field near Sèmè-Kpodji on the coast of the small West African country of Benin. Sylvie’s garden hut stands on sandy ground, surrounded by fields and a scattering of other tiny huts. The sky hangs heavily over the earth in a tropical blue-gray. Nearly 90 percent of the country’s approximately nine million inhabitants are directly or indirectly dependent on agriculture; its agriculture sector consists primarily of micro-businesses. At Sèmè-Kpodji, around 300 small farmers like Sylvie Sedagondji plant vegetables and fruits – for their own consumption and for sale. Sylvie’s field is one fourth of a hectare. She has “a little of everything” — cabbage, carrots, lettuce. Sylvie slides into her flipflops and walks to her well, starts up the diesel motor which pumps the ground water from nine meters down, and pulls the pale yellow hose behind her in the sand. 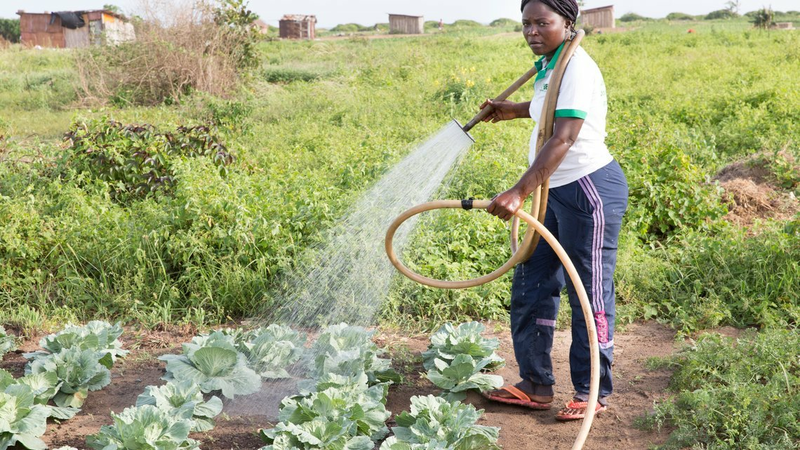 She waters her fields several times a day, up to three hours in all. The aridity is her worst enemy. Sylvie, 39, has seen hard times. Six years ago she began to plant vegetables here to feed her two children, her husband (a tailor) and herself. She became very ill from the chemicals that she was using. The doctor gave her a poor prognosis if she didn’t immediately stop handling and breathing in the pesticides and artificial fertilizers. In an organic farming project of the local partner organization “Association pour le Maintien d’une Agriculture Paysanne,” promoted by Helvetas, she heard about the advantages of organic vegetable and fruit farming. 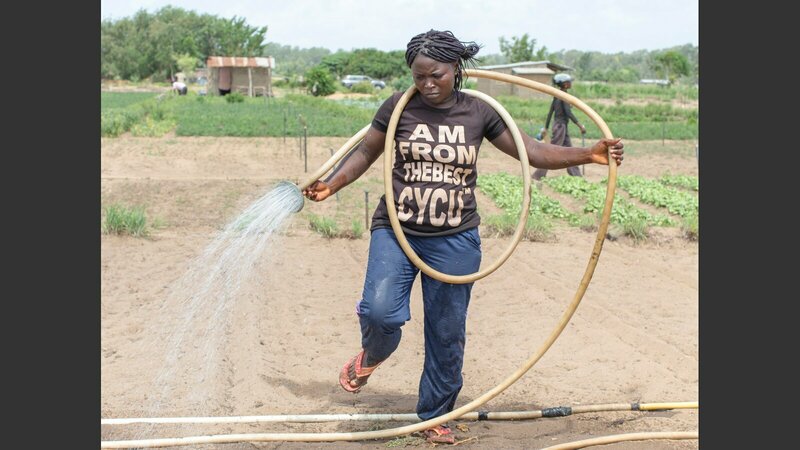 She learned how she could plant her crops without toxic fertilizers and pesticides, and sell them to customers at the local market at fair prices. She only sees her family on the weekends; it’s too long a trip from the field to her home, in Cotonou, Benin’s capital. So during the week she works the fields, far away from her children, and sleeps at night in her hut. Sylvie Sedagondji is one of 110 farmers, many of them city-dwellers like herself, who raise crops out here and who have switched to organic methods. Since these farmers no longer use harmful substances, they are protecting their own health as well as helping to conserve the soil. They make their own compost to serve as organic fertilizer. Above all, however, they profit from a purchase guarantee: twice a week, a truck comes to the fields to collect the surplus fruits and vegetables that the farmers don’t need for their own families, and brings the harvest to the economic metropolis of Cotonou. There the goods are sold in five different organic shops, and also divided up into baskets according to pre-orders. Customers buy a subscription in advance and have a certain amount of selected products delivered each week; this guarantees the farmers and their families a steady income. An organic certificate, introduced locally in 2014, helps illustrate to potential customers why it’s worth buying organic agricultural products. In the meantime, this certificate has been established as a national organic label. It’s Wednesday, and the heat is oppressive. Just a few minutes’ walk from Sylvie’s field, Ulriche Hontonnou sits on an old automobile seat in the shade of a papaya tree and eats beans with onions and cassava flour, which she has cooked over an open fire. A clock and a poster with English words — “toe”, “chest”, “shoulder” — hang in her corrugated sheet metal hut. “So that my youngest son learns English, when he comes and helps me in the field,” she says. Today she and her children are doing well, because she’s earning a regular income from the sale of organic products. One of her sons even attends middle school. Ulriche walks in her bare feet, a watering can in her hand, on a narrow path past cucumbers, cane sugar, amaranth (her favorite crop), lettuce and fennel. Smiling, she waters the young plants to her right and left, looking like a model on the runway. Ulriche loves her garden, and she loves her vegetables. And she’s a fighter. She has five children and has raised them alone for the past 16 years. 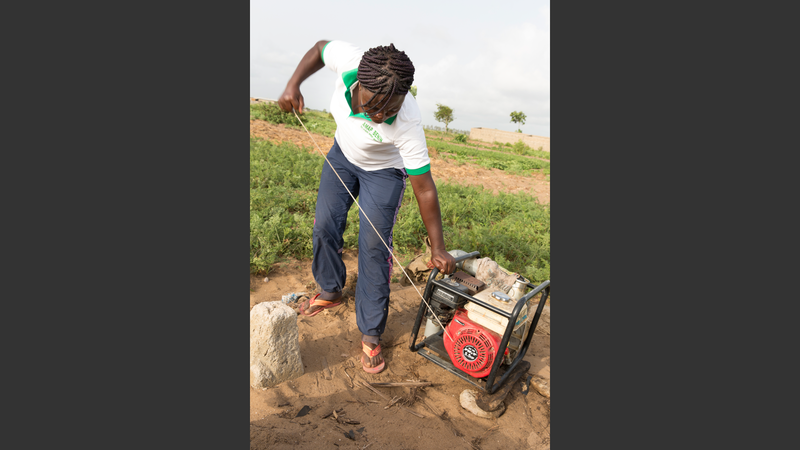 Before she received 14 months’ training as a vegetable farmer, she had sold bottles of gasoline along the side of the road in Cotonou — like many others. Now she rides the bus for an hour every early morning to get here from her city district, and back again after sundown. She, too, plants on a quarter hectare of land – by hand, and with much dedication. On weekends she helps her children and her brother. One of her sons would also like to become a farmer, as he enjoys working in the field. “And he sees that he can earn something by it,” says Ulriche. Near Ulriche Hontonnou’s hut lies an open sack, brown compost oozing out. This organic fertilizer is her only aid in the field. The facility for compost production, which Helvetas built in 2013, works well and with an impressive simplicity. It’s located just a five minute walk from Ulriche’s field: a cement floor, protected by a straw roof. In front of it, in the open air, lies a mixture of straw and animal feces. The compost master collects the organic mass from the livestock market in Sèmè, a few hundred meters further. This is manure off the trucks which come from the northern neighboring countries of Niger and Burkina Faso, bringing and selling livestock here. The heavy trucks then transport fish and other harbor goods from Cotonou back to the north. The feces are already slightly decomposed from a week on the road. After two more months in the open air, the manure is then put by the compost master through the metal compost mill: larger pieces or bits of wood which get caught in the grate are then left to further decay in the fresh air; the filtered mass is sifted a second time and then packed in large sacks. A ton of organic fertilizer is thus created each month, which the farmers buy at a fair price. Ulriche coverts her tomato seedlings with palm leaves. She’s optimistic about the future.